Yvonne Rediger was born in Saskatchewan, lived and worked in northern Manitoba, Edmonton Alberta, southern New Brunswick, Saskatchewan and now resides on Vancouver Island, British Columbia. Yvonne has been writing since she was in her teens. Her favourites genres are Paranormal, Science Fiction, Mysteries each with a bit of humor and of course romance. She is married to her scuba diving buddy who is also her sailboat captain. She has two children and is owned by one Siamese cat. 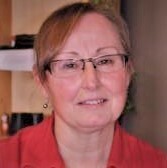 Yvonne is a member of the Federation of BC Writers and Vancouver Island Romance Authors group (VIRA). To ask Yvonne Rediger questions, please sign up. Yvonne Rediger Writing, when I am on a roll, is like reading a great book, I can't wait to see what happens next! Yvonne Rediger Wow, this is interesting. I actually just finished writing "Diving in Heart First"
a romantic suspense that takes place at the Utila Dive Lodge, on the…moreWow, this is interesting. I actually just finished writing "Diving in Heart First"
Miss Agnes and the Garry Oaks: Who is the busiest body in the Cowichan Valley? Diving in Heart First: Deke said he'd keep Maddie safe, but didn't realize he was the one at risk. Wolf of Crofton Lake: Is it an ancient legendary predator, or some new evil lurking in the wood? The Shape of Us: Who Knew There Were Shapeshifters On Vancouver Island? Loved it! The humour, the setting, the story twists, all good! We ask that you only vote if you are planning on participating in our discussion should your choice win. Which Cozy Mystery would you like to read in April? How to Promote Your Book. Valuable and helpful book launch info! We’d love your help. Let us know what’s wrong with this preview of How to Promote Your Book. by Caitlin Jans. Excellent writing advice, with examples!